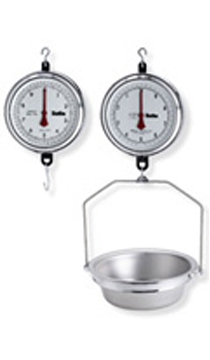 The 4200 Series mechanical hanging scales are world-renown for their accuracy, dependability and reliability. They feature a glass-covered 9-inch double dial featuring bold black numbers and graduations. Pointers are a contrasting red. Scales feature a fully supported stainless steel pinion in oil-less bearings and a precisely mated bronze rack for rugged dependability. Scale capacity is achieved in three pointer revolutions. The 4200 Series may be specified as a Class lll "Legal for Trade" scale. Available in aviordupois and metric models, the 4200 Series can be supplied with a bottom hook (nickel plated steel) or the popular AS circular pan. The AS Pan is constructed of stainless steel. The supporting ring and bow are of nickel plated steel. The removable 5-inch deep round pan has drain holes and is USDA approved for use in general food handling. • H44 Class lll "Legal for Trade"